These orange spuds have a natural sweetness about them that makes cooking interesting. It’s best to keep your ingredients simple so the potato’s true flavor is still present and all of the nutrients (it’s an excellent source of fiber, potassium, vitamins A & C) are not lost. While they require a bit more attention compared to a Yukon Gold or red potato, a sweet potato can be slow roasted, sauteed, boiled, and yes, even microwaved. Quick vegetable recipes don’t have to be boring, and, most importantly, they don’t have to require a hot oven or stove, messy clean up or olive oil-splattered countertops. Microwaves are the way to go! Give this quick and delicious recipe a whirl. With its heavenly herb aroma and melt-in-your-mouth texture, no one would ever have a clue you prepared it without an oven. It’s perfect for a no-fuss, vegetarian dinner for yourself or a snack to split with your roommate. Just remember to keep it simple and let the sweet potato’s personality come through. Prick one well-rinsed sweet potato several times witha fork. Wrap it in a paper towel and place in the microwave for eight minutes, checking and turning occasionally. Once the eight minutes are up, start chopping your garlic and gather all of your other ingredients as the potato is cooling off. In a microwave-safe small mixing bowl, add butter, chopped garlic, oregano, parsley, basil and lemon juice. Stir the mixture and put in the microwave for 30 seconds. Once the mixture is melted, stir it all together with a fork and add in the parmesan cheese, salt and pepper. 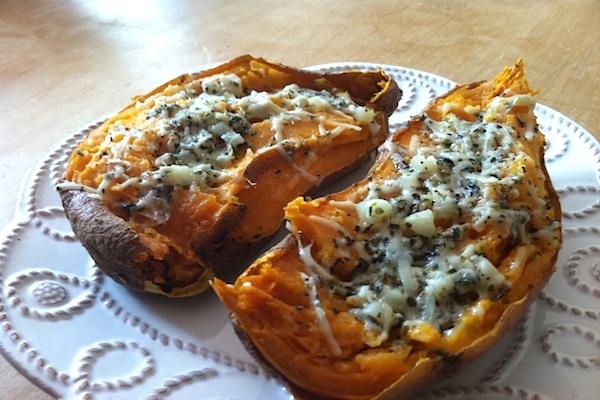 Slice open the sweet potato and divide it into two. Place on a microwave safe plate with the fleshy orange part facing upward. Take a fork and slightly mash up the potatoes with the outer skin still intact. With a spoon, evenly distribute the butter and herb mixture all over each the potatoes. Feel free to mash it up more with a fork so that every crevice gets filled with the flavor. Place in the microwave on high for 1-2 minutes, to melt the cheese. Let it cool and enjoy. Thank you for this idea! I have been struggling to come up with at least some small meals to have in my room here at college. Cafeteria is not so kind to vegetarians. This was perfect easy thing to make after a really hard workout today. I make something real similar. I slice up sweet potatoes, Toss them in olive oil and sprinkle with Thyme then roast until brown in a 425 oven. So good served with melted butter and parmesan cheese! I’ll have to try your recipe too. 19 Food Hacks For Your College Dining Hall | シ最愛遲到.! Nice photos! I love this healthy food recipe so much. Thanks for sharing.